Colin Kaepernick has been out of work for over a year. But now, he’s officially signed a multi-year contract with Nike, making him the face of the 30th anniversary of their “Just Do It” campaign. When most people see the name, they no longer remember the NFL quarterback who took the San Francisco 49ers to the Super Bowl. Instead, they remember the man who took a knee on the sidelines during the national anthem in the summer of 2016, protesting against racism and social injustice. Following Kaepernick’s lead, a wave of on-field protests began, with hundreds of players raising their fists or taking a knee during the playing of the anthem. The NFL has struggled to contain these protests, and TV ratings are declining. Football fans have been heated over the situation, many of them choosing to boycott the NFL in general. Even President Trump targeted the NFL for not firing players who refuse to stand for the anthem out of respect for our troops. This deal with Nike is bound to make things pretty awkward for the league. Back in March, Nike signed a contract (through 2028) with the NFL, with plans to supply 32 teams with game-day uniforms and sideline apparel. But now, Nike will be also be producing exclusive Kaepernick apparel and will be donating money to the former NFL player’s “Know Your Rights” campaign. Nike recently said that it “supports athletes and their right to freedom of expression on issues that are of great importance to our society,” even knowing that their decision to make Kaepernick the new face of their brand might be bad for their business. The Kaepernick story has dominated the NFL narrative, and Friday, he received a standing ovation from the crowd at the U.S. Open match between Serena and Venus Williams. The quote is more than just an ad campaign. It’s something Colin Kaepernick stands by … and kneels for. But among all hateful people choosing to boycott Nike, Kaepernick has seen an influx of support as well. 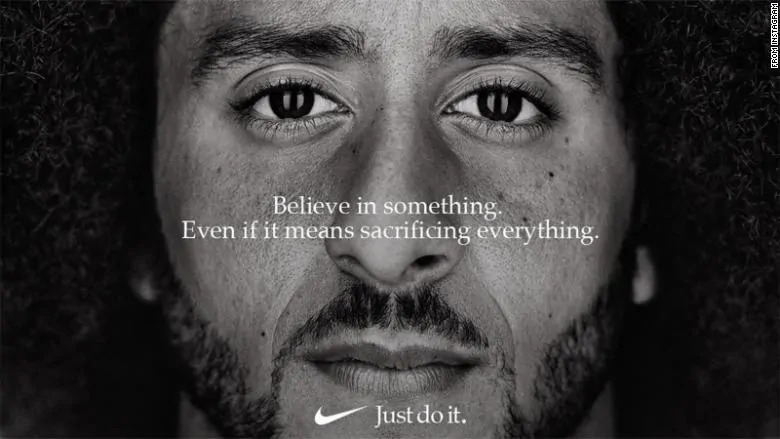 Kaepernick has always received support from fellow athletes throughout his campaign for racial equality, and this remained true following the release of the new ad. Whether you agree with Nike doing the Kaepernick ad or not it’s bold and I like it. Wish more big companies took risk to make a statement.